Kometos provides thawing systems for efficient and controlled defrosting of any deep-frozen food products. Thawing equipment is perfectly suited e.g. for defrosting of meat, fish and poultry products. Our modular production facilities are suitable for several branches of food processing industry and can be tailor made to meet all needs and requirements due to the fact that they can be modified and expanded. Kometos carwash concepts consist of 1 - 3 carwash modules and 1 - 2 technical spaces. We produce, prepare and test drive all the process lines at our factory. Due to this unique way of operation, the installation time is really minimal. 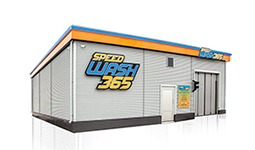 We can also tailor made the exterior of the carwash module according to your wishes. Modules are easy to transport to another location if required later.